Green Willow Books, New York, 2006. 387 pages. 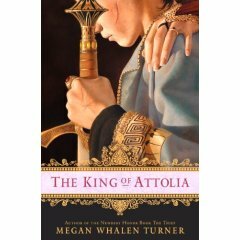 The King of Attolia is a sequel to Newbery honor winner The Thief and its follow-up, The Queen of Attolia. All three of the books have surprises and reversals toward the ends of the books. So I’m afraid I can’t even tell you the situation at the beginning of this book—since it will give away surprises in The Thief and especially in The Queen of Attolia. I definitely recommend reading these books in order, since that will give you the fun of the surprises. As soon as I learned from our library book rental brochure that this book was out, I ordered a copy for myself. The books are so good, I knew I’d want to own it and read it many times. When it arrived, I read through it, and then I began reading the first book to my son at bedtimes. Much to my delight, he doesn’t remember the plot from the time quite a few years ago when I read it to him before. I have to say that in some ways these books are even more fun to read the second or third time. You can see all the places the author planted clues of what will be revealed later. You appreciate her genius all the more. My favorite of the three books is still The Queen of Attolia. But this follow-up was also truly wonderful. There were a few plot threads left hanging—I very much hope this means she’s planning to write more about the adventures of Eugenides. I would definitely love to read more. William Morrow, New York, 2004. 353 pages. I loved this book! The subtitle says it’s a novel of suspense, but it’s also a historical mystery tale with romance, intrigue, and a smart, capable heroine. The book features an actual historical character, Alaïs Capet, the daughter of Louis VII and his second wife, Constance of Castile. At a very young age, Alaïs and her sister Marguerite were sent to England to live with the court of Henry II and Eleanor of Aquitaine, the first wife of Louis VII. Alaïs and Marguerite were betrothed to Henry II’s sons, Alaïs to Richard the Lionheart, and Marguerite to Henry Court Mantel. However, when Eleanor lost favor with Henry for plotting with her sons against him, he had her imprisoned in a tower and took Alaïs as his mistress. She never married Richard. The book opens many years later. Richard and Henry are both dead and the younger brother John is ruling England, but doesn’t have a firm hold on the throne. Eleanor sends Alaïs to Canterbury to recover some letters which might hurt John’s power. Eleanor hints that she can give Alaïs information about a secret near to her heart, a secret she long thought was dead and buried. The person in charge of Canterbury, William of Caen, once also lived in the court of Henry and Eleanor. He took his lessons with the royal children, including Alaïs, and was tormented by the princes, because he was their father’s favorite. Alaïs finds him quite changed since she last saw him. He also seems to know more than he lets on. Alaïs is kidnapped just before she is able to recover the letters. She’s held in the same tower where Eleanor was once imprisoned. Now King John wants information from her—information she doesn’t have. This story is full of action, suspense, and romance, and is highly enjoyable reading. I wouldn’t call it chick lit, because the historical background and political intrigue give it more weight than your typical light mystery. This is Judith Koll Healey’s first novel, but I hope there will be many, many more to follow! I’m starting to be amazed at how the exactly right book keeps coming into my life at exactly the right time. It makes sense. God of course knows me, and knows that the easiest way to get a message to me that I need to hear is to send it my way in a book. So I’m calling them my “current book from God.” As soon as I finish one, another comes my way. With this book, as soon as I’d gotten about a third of the way through, I liked it so much, I decided to order myself a copy, so I could go through it slowly, doing all the exercises. “My emphasis on healing, growth, and empowerment means that you will not see in these pages lengthy checklists of behaviors that qualify you as a victim or lengthy descriptions of resentful, angry, or abusive men or explorations of how bad they are. You know better than anyone else that your relationship has put thorns in your heart. You don’t need a description of how much they hurt or how bad it is for you to keep them. You need to learn how to take them out and how to heal the wounds in ways that prevent scarring. Checklists and bullets about the behaviors or attitudes that qualify as resentful, angry, or abusive would distract you from your most important task. The true issue at stake is your core value—the most important things about you as a person—not his behavior or your reactions to it. As you reinforce and reconnect with your core value, you are far less likely to be a victim. As you experience the enormous depth of your core value, the last thing you will want to do is identify with being a victim, or with the damage or bad things that have happened to you. In your core value, you will identify with your inherent strengths, talents, skills, and power as a unique ever growing, competent, and compassionate person. You want to outgrow walking on eggshells, not simply survive it, and you do that only by realizing your fullest value as a person. The renewed compassion for yourself that you learn in these pages will lead directly to a deeper compassion for your resentful, angry, or abusive partner. . . . You may be able to stop walking on eggshells and walk into a deeper, more connected relationship with a more compassionate, loving partner. It might not seem so now judging from his attitudes and behavior, but your husband wants that as much as you do. If you were to ask, he would probably tell you that deep in his heart he wants to be a compassionate, loving husband, even if he’d blame you for why he isn’t. Now, his solution for a resentful husband is for him to read the “Boot Camp” section of this book. Though that might not be feasible, you can still use the techniques yourself to not react to blame and resentment with your own anger and resentment. As Steven Stosny says, “Compassion directly activates your core value—the most important things about you. In your deepest values, you act with conviction and strength. Compassion is power.” If you give up resentment and choose instead to be compassionate, there is no question that you are going to feel better and more powerful than if you vow to make him pay for whatever he’s done. What’s more, Dr. Stosny has specific techniques, with the acronym HEALS, to teach you to react to a core hurt with compassion rather than with anger. I’m only beginning to practice it, but I’m already very impressed with it. This is so much better than getting angry and storing up retorts or ways to get even. Compassion and forgiveness are better for your body and soul than resentment and blame. He isn’t talking about being a doormat. Love him enough to recognize that his hurting you is killing what little sense of adequacy as a husband he has left. Love him enough to demand that he find it in his heart to value and respect you, according to his deepest values. He seriously violates his deepest values when he fails to value and respect you…. Every time he says a harsh word to you or gives you the cold shoulder, or simply fails to value and respect you, he hates himself a little more. If you’re having trouble feeling worthy of love, Dr. Stosny tells the secret: “Here’s the hot and hard truth: Only your own loving behavior can make you feel worthy of love. It’s not rocket science. The only way to feel lovable is to be loving and compassionate.” And he helps you learn to do that. This is a wonderful book. 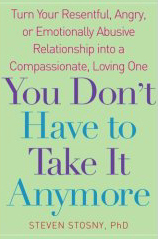 I highly recommend it to anyone who’s ever felt any resentment toward anyone! I also ordered from Amazon two other books by Steven Stosny that teach the HEALS technique, Manual of the Core Value Workshop, and The Powerful Self. I want to learn these techniques, because I believe that they will make me a more compassionate and forgiving person, as well as a much happier person. You can learn more about Steven Stosny’s work at the website http://www.compassionpower.com/. I’ve finally chosen the 2007 Sonderbooks Stand-outs! These are the best books I read in 2006, reviewed between March 2006, and September 18, 2007. For the next couple of weeks, I’m going to feature the Stand-outs on the main page and convert their reviews to the new format. Then I’ll post new reviews again. Stand-outs are the books that stick out as exceptional when I look back over a year of reading. The sort of books I want all my friends to read, too! You are currently browsing the Sonderbooks blog archives for October, 2007.